First, the kimchi. I’ve been making my own using this really tasty recipe. Before that I got great kimchi at the University District farmers market from the Woodring stand. 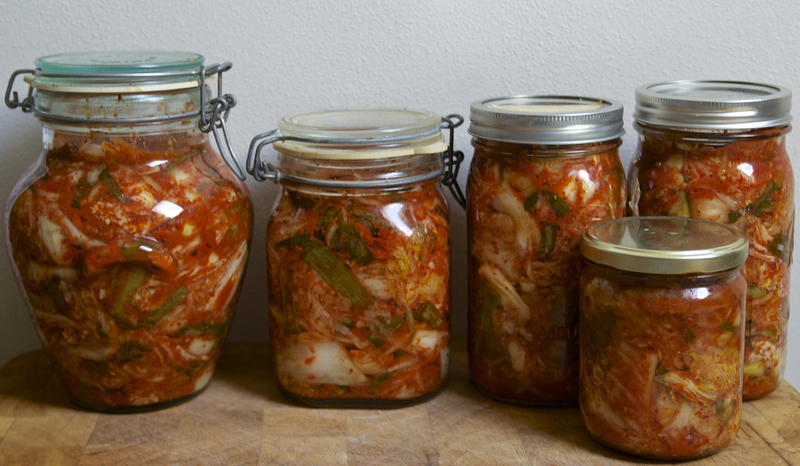 But if you’re cooking with kimchi, I recommend using a less specialty kimchi, either part of your giant homemade batch or a simple one from a grocery store. Kimchi House in Ballard sells containers of their made-in-house kimchi. Second, the latkes. It turns out potatoes and kimchi are delicious together. I served these with sour cream to which I added small amounts of other flavors: sesame oil, sesame seeds, scallions, kimchi juice, salt, and maple syrup. Don’t add too much of anything liquid or your sour cream will lose thickness. It helps to start with a thick brand, like Wallaby. You can adjust the quantities in this recipe to suit your tastes. But too little kimchi will make the taste get lost in the latke, while too much will make the latke hard to fry and keep together. 1 very large mixing/salad bowl, preferably with a flat bottom and wide sides that widen as they go up. 1. Grate potatoes and place in a large bowl. Sprinkle liberally with salt. 3. Clean and grate leeks and add to the potatoes, removing any of the tough outer or green parts. You can substitute two bunches of scallions or a small onion, but if you grate an onion press the water out before mixing it into the batter. 2. Chop kimchi and mix it into the potato mixture. Add the sesame seeds, adjusting the amount as desired. 3. Add two of the eggs and mix in. 4. Add the flour and mix in. If the batter really doesn’t look sticky, add a third egg now. 5. 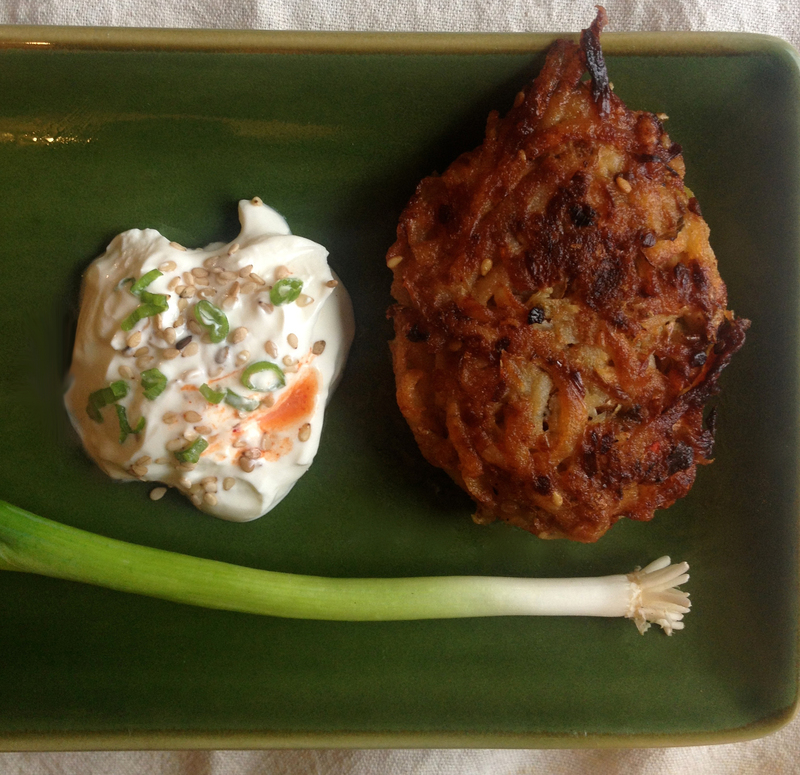 You now have kimchi latke batter. It might start releasing liquid, which we don’t want in the latkes. Here’s the magical solution (which can be used with any latke batter): Scoop all the batter into a colander. Then, set that colander back into your mixing bowl. Excess liquid will drain out into the bowl, from which you can dump it into the sink occasionally. You can press on the batter to expedite this. 6. Heat 1/8″ or so of oil in your pan. Add a dash of toasted sesame oil. When it’s hot, take a palm full of latke batter, press it gently from above with the palm of your other hand, and place it in the oil. Arrange 3-4 of these in the pan. Let that side cook until brown, and don’t poke them too much. 7. When one side is brown, use a metal spatula to flip the latke. I like to flip it two-handed with a large metal spoon in the other hand. Fry the second side until crispy brown, and then place on a waiting plate with paper towels. 8. Is your batter holding together properly and not too moist? If it’s falling apart, you can mix in another egg in. You may also want to taste a test latke at this point to make sure the batter has enough salt. 9. Repeat until batter is used up, replenishing your oil frequently as you go. Serve hot with sesame-scallion sour cream and/or more kimchi. 1. Chop scallions fine. Add to sour cream, reserving a few for the top. 2. Add sesame seeds and salt to taste. Reserve a few sesame seeds for the top. 3. Very carefully add small drops of the wet ingredients, mixing after each. Taste. You want enough to flavor the sour cream, but not so much that the sour cream gets liquidy. 4. When the sour cream suits your taste, sprinkle a few scallions and sesame seeds on top. For those who have been living under a [Plymouth] Rock [of Ages], this year is the first time Thanksgiving and Hanukkah have overlapped since the 1800s, and the last time they’ll overlap for something like 79,000 years. It’s our only Thanksgivukkah ever, which means it’s also my only chance ever to write earnest pleas about eating local for Thanksgivukkah. Local potato (or sweet potato) latkes with local apple-cranberry sauce! Local brussels sprouts refashioned into a menorah! Local turkey fried in local, uh, oil? But in all seriousness, aside from the improbability of finding local chocolate coins or local pecans for pie, Thanksgiving and Hanukkah are two of the easiest holidays to support local farmers and get the tastiest ingredients you need. Local turkeys are hard to find if you don’t plan in advance, but you can always try calling farms listed on Local Harvest as raising turkeys. Keep in mind that farms that raise turkeys one year may not raise them another year. I wrote this humor piece about Thanksgivukkah for jew-ish.com (although the headline is not mine).